In the GitHub code example repository for this week 7, you will see several interesting assets. The ByteFormatter folder has a fully-working and complete media type formatter, built with the instructions below. The “Web API project v2.zip” file is a project template, which includes the beneficial results of this week’s efforts. You can use that template when you build Lab 6, and other new projects in the future. If the media item is to be “linked” to an entity object, then that object must exist. In other words, if you are coding a solution that enables a requestor to, for example, create a new “product” object that has a photo as one of its properties, the solution requires the requestor to create two separate requests. 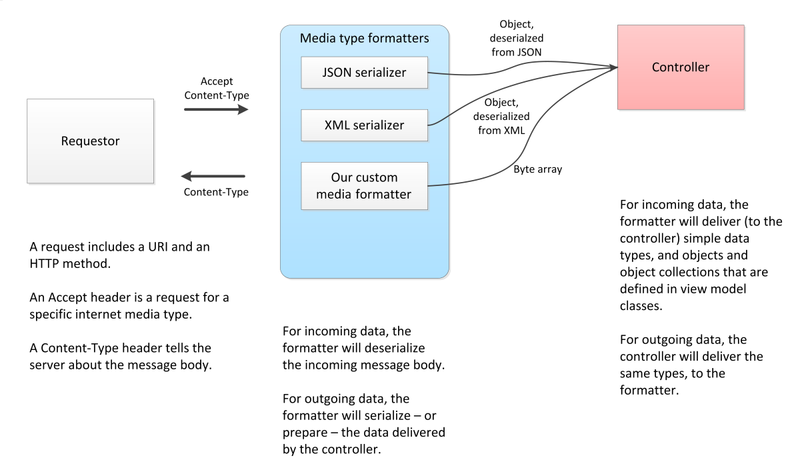 First, create the “product” object by supplying data that can be expressed in the “application/json” media type. Then, using the new object’s identifier, create another request to modify the object, and send along the media item as an “image/png” media type. The image below is an excerpt of the bottom part of the “message handling” image that you studied last week. Click to open it full-size in its own tab/window. However, during processing, while doing work between the controller, to/from the repository, to/from the data store, it is natural and obvious to consider the media item to be a property of an entity object. The BookWithMediaInfo class includes metadata about the media item. 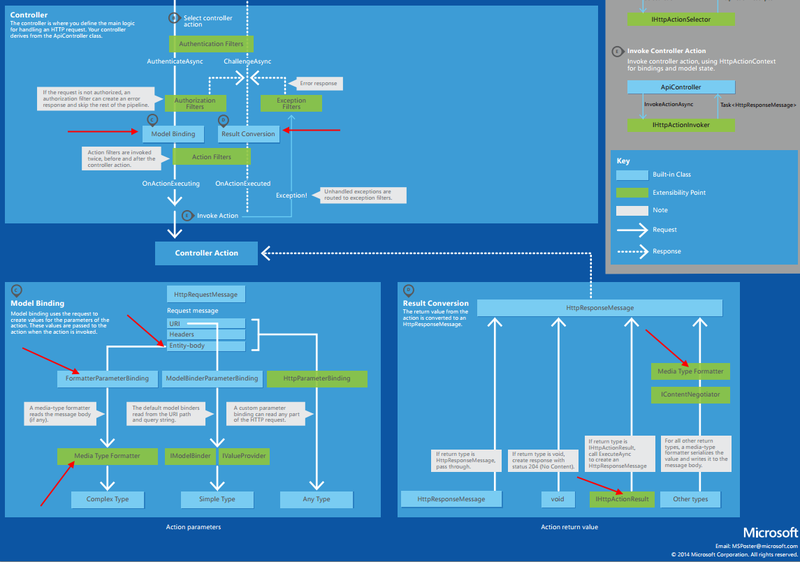 The controller and repository can use the metadata to make processing decisions. The requestor can also do that. Therefore, the repository method’s signature includes parameters for the object’s identifier, in addition to the media item properties. The “get” and “add new” methods return metadata for the media item. They do NOT return the media item bytes.